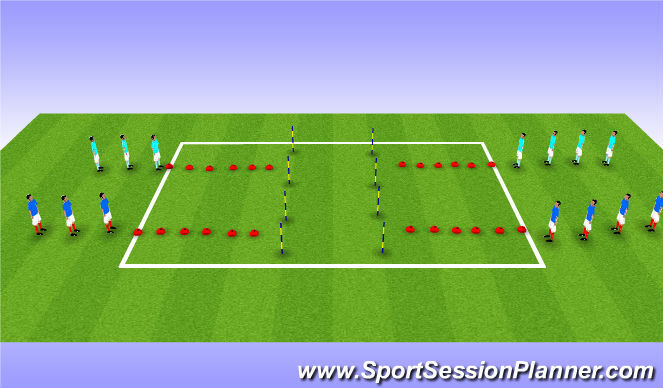 Split the players into two groups, six cones, two poles as a gate, players working from both sides at same time. Moving round the areas getting a feel for the ball. Stop with knee then move ball away with the same foot. Encourage variety of directions, awareness of other players (head up) and move to give them space. 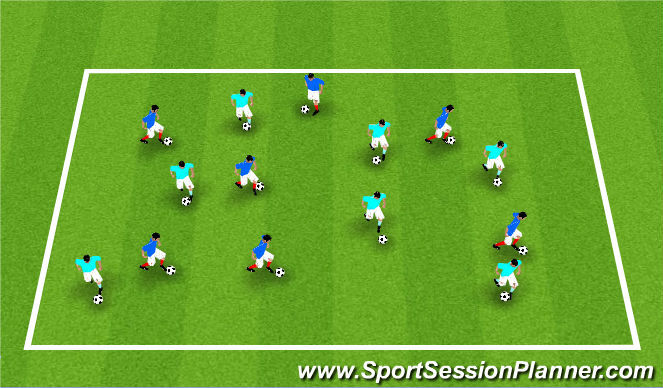 A practice to improve midfield rotation as well as clearing space to allow others to play. Outside players are on 2 touch only. Both teams must keep at least one player in each triangle. The Reds (in possession) combine to play the ball into a different area (as shown). The player who passes the ball out MUST leave that area but can be replaced by another player. (He doesn&apos;t have to follow his pass as shown in the diagram). He MUST be replaced by another player. The player receiving in a 1v1 situation can combine with outside player or play out to another area first time. If he plays out to another area he MUST leave his area and be replaced. 1. Allow players to run/dribble the ball into a different area. 2. Allow 1 outside to outside pass. Think about where, when & why this would happen in a game. 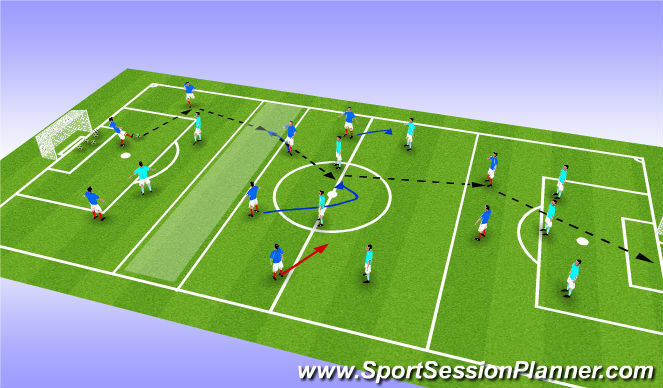 Defensive pressing, quick movement and agility in possession. 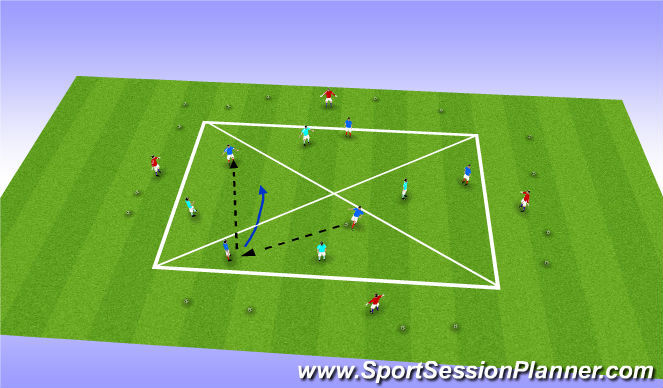 Decision making, where to pass, where to run in possession. Defensively, how to cut off options, mentality to work hard. Communication, team building within units. Midfield players, passing & support, dispersal. Defenders, forcing play in one direction. You may need to adjust the numbers as this session was done by some of the best players in the World and devised by one of the best coaches in the World. The 4 yellows play with the team in possession. The idea is to keep possession for as long as possible. The team in possession tries to open up the pitch, despite the tight area. The team out of possession must press at maximum intensity & intelligence. Every player needs to show for the ball, how the first touch should be played and where to move to next. Play should be as quick as possible (1 or 2 touch). You can select certain players to play 2-touch whilst everyone else plays 1-touch. Guardiola is constantly correcting the players during the practice, almost micro managing the players. It is incredibly intense and he demands maximum effort & concentration. The red defenders start with the ball and the team objective is to score in the opposite goal. The blues defend and score by getting the ball into their forwards. All players are restricted to the areas shown to start with. Only the red midfield players are allowed into the shaded area. The red defenders keep the ball against the blue attackers until a red midfield player drops into the shaded area. If he doesn&apos;t receive the pass straight away he MUST rotate out and be replaced by another player relative to the defender in possession. Rotation of midfield players relative to the ball. Other midfield players to move in relation to the holding midfield player in order to support ahead of the ball. Once the pass has been made out of the shaded area the midfield players combime to play into the strikers to score. Blues can follow into the shaded area. 1 Player can move up or back to create overloads. If the holding midfield player cannot play forward they can set a defender to play to a higher midfield player or striker. Remove all restrictions. Small sided game. Understanding of the role. Understanding of playing through the thirds. 5 mins warm down of static stretches. Toe touches and holding feet for 10 seconds. Arched back, hands on ground, calfs crossed over behind. Seated stretches, twisting back either side. Press up position, forcing back and neck up, dropping lower core. First player goes in and demo&apos;s a stretch, they then think of someone to come in next and shout out their name.